New Hampshire Web Design and Hosting Company - GlobeInt.com, Inc.
Having an attractive website is great, but if no one can find it on the major search engines when using keyword phrases, then it is useless. We make sure that your website will help increase your business through proper search engine optimization. The website that we design for your business will be built on a strong SEO foundation that begins during the initial development of the site. Our websites are built with SEO & SEM in mind. Along with this built-in SEO, we offer additional SEO and SEM services. We also offer linking programs which have proven to improve your visibility in the search engines. If you are trying to achieve a high search engine position, you can inquire about one of our SEO and SEM packages to increase your website's ranking. We will define a content page for your site and integrate the content plan with your SEO plan. The content and SEO plan are based on the market study performed and the goals. The content resources could include important specific facts and descriptions of your business product or service. The content could also include facts/text about your location or any other information which is part of your website. Content resources add depth and variety to your site. A main component of SEO, content resouces is pleasing to both visitors and major search engines. SEM is a type of internet marketing that involves the promotion of your website by increasing the visibility in search engine results pages (SERPs) through SEO and advertising. 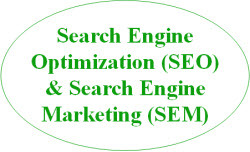 In other words, SEM includes both paid search results and organic/natural search results (SEO). Methods of SEM include paid advertising with Google Ad Words or Bing Ads, pay-per-click, article submission and proper SEO for the site. In 2013, North American spent over $26 million on SEM. The largest SEM vendors are Google Ad Words, Bing Ads and Baidu. Since 2006, SEM is growing much faster than traditional advertising and other online marketing venues. Many companies are increasing their SEM budget by 50% or more. With increasing websites on the internet in the mid-to-late 1990s, search engines began appearing to assist users to find information on the web quickly. Search engines developed business models to finance their services such as pay-per-click advertising which grew exponentially and proved to be big revenue generators for major search engines such as Google, Yahoo and others. Marketing Study Report - We assist you to define your target on-line markets. We will show you search volume which defines the best commercial opportunities for your product or service. You will also find out your on-line competitors in the marketplace. We can then help define segments in the market that will be the most profitable and easy to acquire. Website Goal Setting - Your on-line marketing plan must have goals and objectives. We advise you to set goals that are realistic, that are well defined & measurable and time bound. If you need assistance, we will work with you to come up with attainable goals. Website SEM Implementation - Once steps 1 and 2 are complete, we then implement the SEM plan. Your website will be built with internal linking optimization and with full on-site optimization. An XML site map and Robots' Text file is part of the build. Website Performance Tracking Plan - We set up a web analytics plan and measure the performance of your SEM plan. Website Analytics goals will also be established and set up. By knowing your website performance on a continuing basis, you will be constantly aware of the web activity and interest in your website which will ultimately help your sales performance. Post-Launch and Off-Site SEO (best practice linking) - We make modifications and adjustments to optimize performance after launch. We also define a linking plan to boost search position. Gaining in-coming links to your website is essential for high search engine position. Best practice links are $1 per link per month and there is a once-off $3 set up fee per link. To learn more about our link building features, visit our sister site Website Link Tactics. Conversion Review and Improvement Plan - You want to be ahead of your on-line competitors in the marketplace so it is important to continue to build and develop your website content. Always know your web conversion and consider ways to improve your conversion. We will develop different versions of your key conversion pages and perform A/B Testing experiments. This SEM plan includes 2 A/B test experiments. Let us create or update your SEM plan for your business website. We will provide you with a detailed report showing all the statistics associated with your website i.e. visitors, clicks and the primary keyword search that potential customers use to access your site. From this report, we can determine what you need for your SEM plan to be a success! SEM is the most popular form of advertising in today's marketplace so take advantage of the on-line market to increase sales & revenue! � Copyright 1999-19, GlobeInt.com, Inc. All rights reserved.